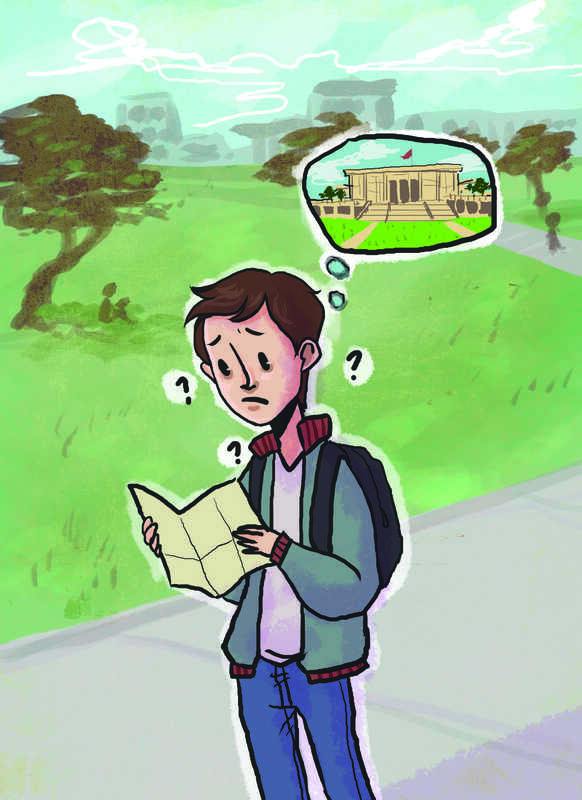 Getting to know your campus is really important but it can also be confusing and difficult to learn for outsiders who don’t know anything about CSUN. CSUN is a commuter school and one of the nation’s largest universities with a very diverse student population. There were a total of 11,060 new undergraduate students as of the fall 2013 semester according to CSUN’s Office of Institutional Research. CSUN is located on 356-acres with over 60 major buildings on the campus, so it would be easy to assume that not everyone is familiar with the campus their first time around. Jaime Valles, 22, a senior majoring in sociology, remembers her first day of freshman year at CSUN back in the fall of 2010 as stressful, confusing and a little overwhelming. Valles was lost, 15 minutes late to her first class and later that day found out she had gotten a parking ticket because she thought parking the first week of school was free. Here are the most basic answers to the most basic questions about CSUN you are too embarrassed to ask. “Where is the library and what do they offer?” asked Elizabeth Trejo, 18, freshman. The Oviatt Library is located in the center of the campus across the Oviatt Lawn. There are three computer labs which are all located on the main floor of the library along with 150 separate computer workstations. They also lend laptop and iPad checkouts at the Learning Commons Technology office and have different areas for printing. The library also offers individual or group study rooms on a first come, first serve basis, while other study rooms have to be reserved using their online reservation system. “The library is a good place to study, relax, charge your stuff or just wait to kill time in between classes,” said Araceli Jimenez, 23, senior majoring in political science. “What is the SRC?” said Paulina Hernandez, 21, junior and first time transfer student majoring in sociology. The SRC is the Student Recreation Center, a 138,000 square foot gym. This facility offers different types of fitness and group exercises classes; there is also up-to-date equipment, an indoor track, a swimming pool and much more. The price of the SRC membership is included with your tuition fees so you don’t need to pay anything extra in order to sign up. “Where is the lab where you can print for free and how much can you print?” said John Phillips, 19, sophomore majoring in business. The computer lab is located at the University Student Union (USU). CSUN students can print (for free) up to 20 pages per day. You can print directly from the lab or do it from you laptop from home or on campus by uploading your document on their USU PrintAnywhere website. You then collect your pages at the print station at the USU anytime but it has to be within the next two hours. “Where are the best bathrooms?” said Jessica Martinez, 18, freshman majoring in English. According to the Daily Sundial Best of CSUN 2014 students voted that the best bathroom on campus was the USU bathroom. The USU is located across the SRC and near the Plaza del Sol. “Where can I get good food?” Jessie Ferguson, 20, sophomore undecided. CSUN offers various locations on campus to eat. Voted the top three in the Best of CSUN 2014 were Arbor Grill, The Pub Sports Grill and the Marketplace. “Arbor grill is my favorite place to eat it’s fast and they pretty good stuff if you’re on the go like burgers, salads and pizza,” said Brianna Orozco, 23, senior, majoring in liberal studies. “What is a MataMoney card?” said Luis Lopez, 18, freshman majoring in business. A MataMoney card is like a prepaid dining card where you load it with as much money as you want and use it at various CSUN dining locations and get 10 percent off every food purchase. The MataMoney dining card is free and is available at most dining locations. “Can anyone go to Health Center on campus and what do they offer?” said Alexa Munoz, 21, junior majoring in psychology. The Klotz Student Health Center is open to all currently enrolled students at little or no cost according to the Student Health Center website. The Student Health Center offers students various services on campus from a regular check-up to dental care and vision. They are also equipped with a pharmacy, laboratory and x-ray center. The Student health Center is located across the G3 parking structure and next to Chaparral Hall. “What is CSUN’s mascot?” said Henry Behari 18, incoming freshman who is undecided. According to the CSUN online history page, in 1958 students selected “the Matadors” as the official mascot for the campus along with the campus colors, which are red and white. The Matador was selected from five final choices, which were the Falcons, the Apollos, Rancheros, Titans and the Matadors.